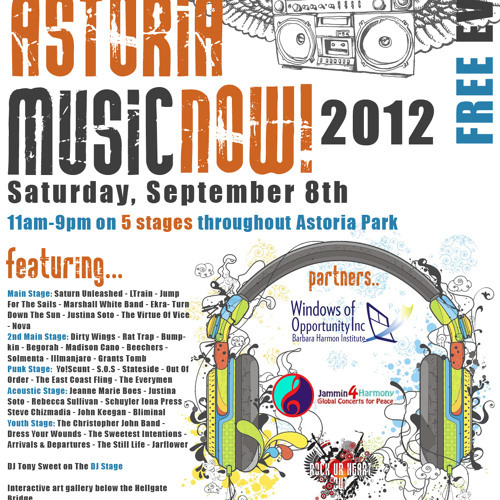 REQUIEM FOR ASTORIA MUSIC NOW 2012 This song is in honor of the Festival that wasn't. We pay homage to every band and performer that was supposed to play by mentioning them in this track. It’s time for Astoria Music Now Again And the weather report got us all wondering If it rains on our Happy Lives and thunder bangs Will we get see happy lives and Thunderbang? The Marshall White Band? (Not Tonight Man) What about Nova? (I don’t know bra) How about Yo!Scunt? ( I don’t know son I don’t think no one’s gonna be performin) I really wanted to see Rat Trap Bumpkin Haven’t seen them in mad long now ain’t that something I heard Jeff Lutz was doing Stand up With Brandon Greenspan and Post grad productions Stephanie Holmes might as well stay home Cause she can’t tell jokes when ground’s all soaked We know you were stoked for Madison Cano and an East Coast Fling with Jeanne Marie Boes but... Rude mood’s mood isn’t gonna improve Start Dressin your wounds, go back Grant’s Tomb Dude I wanted to see Damien D. Munz I think he’s still playing but venue's been moved The Windows of Opportunity lived up to their name They moved to Hollis Woods Community to stay out the rain Bell Blvd They got Arrivals and Departures JarFlower, Sir Roric, J. Whizz and John Bostic Is Still life still on that bill tonight? That’s right g Plus Sean T. Hanratty and the Mighty Mighty They still get to play but we can’t all be so lucky Unless youre name is Courtney Elizabeth O’Buckley But that isn’t the deal for libs on the reel And Katie Haller, got her number? better call her Tell her the events canceled don’t bother we’re jumping for the sails cause the equipments under water Begorah and Rebecca Sullivan ain’t gonna get a Mulligan John Keegan’s got another band and they gonna be opening At the quays for Dirty Wings, I think it starts at 8pm But I can’t say the same for Solmenta and the Everymen I wish we could hear every band but we still get to see Bliminal at the Quays. (No, Keegan’s band is Greenstreet. ) It wasn’t Beecher’s Fault They had the sweetest intentions Luckily they’ll still be playing the Shilelagh at Seven We had 9 days to drop but the rain dropped first Sorry Out of order. didn’t account for clouds of water Tell Virtue of Vice it didn’t work out right Scarecrows for hire so sorry. You’re Fired Send an SOS to Schulyer Iona Press Hey, Rick Rocker. It rained. Big shocker. Sorry Ekra, Maybe next year, How’d you get here? You take a cab. We’ll pay for Equa Steve Chizmadia never even made it here Neither did Metorana to avoid the tornado We’re real sorry it rained bro Cause we were really looking forward to your entertainment But what can we say Its over stop calling me There’ll be no Mary Desiree, no Saturn Unleashed DJ Tony Sweet Sweet magma sweet afton skatepark stage it aint happening That’s a rap, done.